For colonial exhibitions in general, see Colonial exhibition. "The Queen Opening the Colonial and Indian Exhibition: Procession passing the principal entrance to the Indian Palace", The Illustrated London News, May 1886. Jamaica's display at the exhibition. Linen map of the British Empire that was sold at the exhibition. The Colonial and Indian Exhibition of 1886 was a very substantial exhibition held in South Kensington in London, and intended (in the words of the then Prince of Wales) "to stimulate commerce and strengthen the bonds of union now existing in every portion of her Majesty's Empire". The exhibition was opened by Queen Victoria, and when it closed had received 5.5 million visitors. It was housed in a collection of purpose-built buildings designed in an Indian style. The India artware section was split into different areas representing the different princely states. The Rajputana entrance was a large Jaipur gate constructed of and provided by the then Maharaja of Jaipur. The Gwalior gateway which had been displayed at the Calcutta International Exhibition (1883) was loaned by the Victoria and Albert Museum. Several dozen Indians were imported, reputedly from Agra jail, to serve as living exhibits; they were described as artisans, it appears that they were trained in their crafts as part of the British Empire's long-term project to 'reform the criminal castes'. ^ The Illustrated London News, 8 May 1886, p. 478. ^ Saloni Mathur, India by Design: Colonial History and Cultural Display (Berkeley: U of California P, 2007), p.57. ^ a b c "The Jaipur Gate". Retrieved 12 March 2012. ^ "British Museum - Search object image". Retrieved 12 March 2012. ^ "British Museum - Search object details". Retrieved 12 March 2012. ^ "The Haggin Museum - Collections: Art: Albert Bierstadt: After Norther, Bahamas". Retrieved 4 April 2012. ^ "Photographic guardbooks: Images of India | Victoria and Albert Museum". Retrieved 4 January 2017. ^ Mathur, Saloni (2007). India by Design: Colonial History and Cultural Display. University of California Press. p. 60. ISBN 9780520234178. OCLC 76481430. Retrieved 13 January 2015. Colonial and Indian Exhibition, 1886 Official Catalogue. London: William Clowes and Sons. 1886. ISBN 0665052553. Retrieved 13 January 2015. The Victoria and Albert Museum in London is the world's largest museum of applied and decorative arts and design, as well as sculpture, housing a permanent collection of over 2.27 million objects. It was founded in 1852 and named after Queen Victoria and Prince Albert. The Pergamon Museum is situated on the Museum Island in Berlin. The building was designed by Alfred Messel and Ludwig Hoffmann and was constructed over a period of twenty years, from 1910 to 1930. The Pergamon Museum houses monumental buildings such as the Pergamon Altar, the Ishtar Gate of Babylon, the Market Gate of Miletus reconstructed from the ruins found in Anatolia, as well as the Mshatta Facade. 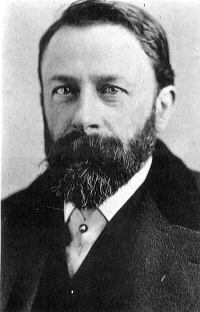 Albert Bierstadt was a German-American painter best known for his lavish, sweeping landscapes of the American West. To paint the scenes, Bierstadt joined several journeys of the Westward Expansion. Though not the first artist to record these sites, Bierstadt was the foremost painter of these scenes for the remainder of the 19th century. The Denver Art Museum — DAM is an art museum located in the Civic Center of Denver, Colorado. The museum is one of the largest art museums between the West Coast and Chicago. It is known for its collection of American Indian art, and its other collections of more than 70,000 diverse works from across the centuries and world. The Carnegie Museum of Art, abbreviated CMOA, is an art museum founded in 1895 by the Pittsburgh-based industrialist Andrew Carnegie. It is located in the Oakland neighborhood of Pittsburgh, Pennsylvania. The museum holds a distinguished collection of contemporary art, including film and video works. The museum was the first museum in the United States with a strong focus on contemporary art. As instructed by its founder Andrew Carnegie at the inception of the Carnegie International in 1896, the museum has been organizing many contemporary exhibitions that showcase the "Old Masters of tomorrow". Today, it's one of the most dynamic major art institutions in the country. Tipu's Tiger or Tippu's Tiger is an eighteenth-century automaton or mechanical toy created for Tipu Sultan, the ruler of the Kingdom of Mysore in India. The carved and painted wood casing represents a tiger savaging a near life-size European man. Mechanisms inside the tiger and man's bodies make one hand of the man move, emit a wailing sound from his mouth and grunts from the tiger. In addition a flap on the side of the tiger folds down to reveal the keyboard of a small pipe organ with 18 notes. The British Empire and Commonwealth Museum was a museum in Bristol, United Kingdom exploring the history of the British Empire and the effect of British colonial rule on the rest of the world. Manish Arora is an Indian fashion designer based in New Delhi. In early 2011, he was appointed creative director of the womenswear collection of the French fashion house Paco Rabanne, although he left the company in May 2012. Sir Samuel Swinton Jacob, was a British Army officer and colonial engineer, architect and writer, best known for the numerous Indian public buildings he designed in the Indo-Saracenic style. The Millennium Gate Museum is a triumphal arch and Georgia history museum located in Atlanta, on 17th Street in the Atlantic Station district of Midtown. Based on the Arch of Titus, the monument celebrates peaceful accomplishment, with special attention paid to Georgia's history and people. As of 2011, it is the largest classical monument to have been dedicated since completion of the Jefferson Memorial in Washington, D.C. The arch inscription reads, in Latin: "This American monument was built to commemorate all peaceful accomplishment since the birth of Jesus Christ in the year of our Lord, MM." The Victoria Memorial is a large marble building in Kolkata, West Bengal, India, which was built between 1906 and 1921. It is dedicated to the memory of Queen Victoria (1809–1901) and is now a museum and tourist destination under the auspices of the Ministry of Culture. The memorial lies on the Maidan (grounds) by the bank of the Hooghly River, near Jawaharlal Nehru Road. Every year thousands of people come to visit this museum. The Rocky Mountains, Lander's Peak is an 1863 landscape oil painting by the German-American painter Albert Bierstadt. It is based on sketches made during Bierstadt's travels with Frederick W. Lander's Honey Road Survey Party in 1859. The painting shows Lander's Peak in the Wind River Range of the Rocky Mountains, with an encampment of Native Americans in the foreground. 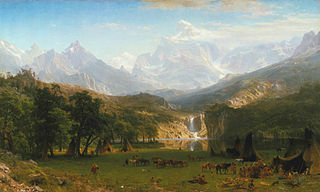 It has been compared to, and exhibited with, The Heart of the Andes by Frederic Edwin Church. Lander's Peak immediately became a critical and popular success and sold in 1865 for $25,000. The Fleming Museum of Art is a museum of art and anthropology located at the University of Vermont in Burlington, Vermont. The museum's collection includes some 25,000 objects from a wide variety of eras and places. Until 2014, the museum was known as the Robert Hull Fleming Museum.